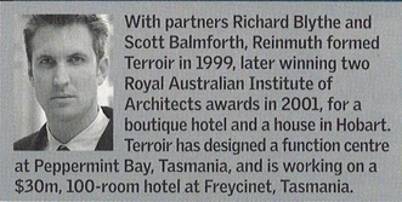 Gerard Reinmuth has been selected as one of Australia's "Smart 100" people tipped to influence Australian culture and life in this annual review by Bulletin magazine. Susskind, Anne. 'The Bulletin Smart 100: Design'. The Bulletin. 5th October, 2004. pp. 60-61.